English or Polish in Krak(ó)w? When you go for a night out in Krakow, do you head for a club or a klub? What about the grocery run… do you stock up at the shop or at the sklep? As an international city, welcoming tens of thousands of tourists from all over the world each year, and with a sizeable population of medium and long-term expats living, working and studying, does Krakow have a responsibility to make information about services and facilities understandable to as many people as possible – or does the ‘shop’ sign in place of the ‘sklep’ pose a threat to the Polish language and discriminate against the local population? The Krakow edition of the newspaper Gazeta Wyborcza took on the issue of language, and found that, while there was some support for using English to attract trade and benefit from Krakow’s cosmopolitan nature, others saw the use of languages other than Polish as ‘snobbism’. Some even argued that, by using English instead of Polish, businesses in the city could lose customers as Poles – the majority nationality in Krakow – seek goods and services at establishments that use the Polish language either primarily or in some cases exclusively. 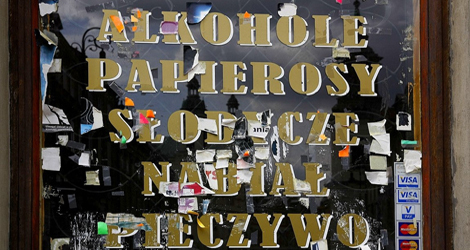 Should signs be in Polish or English? Sklep/Shop - who cares, as long as they have what I need? Why not just rebrand yourselves as a translator for the local press? If you want bilingual signs, why not use Esperanto as well as Polish? After all, Esperanto started life in Poland 125 years ago. @Jack, the author has already credited the story to Gazeta Wyborcza. so, I guess that’s ok? Jack, not everyone reads Gazeta Wyborcza and – er – it’s in Polish …. If a city recognises it is a popular tourist destination then it is sensible to have shop signs in English, it has after all become the common language of communication . But it would be unfortunate if shop owners competed both in size and gaudiness of their signs. For ex-pats show a bit of courtesy and learn the language. Tourist and businesses expect the international language to be used. Or maybe Polish holiday makers traveling abroad should be forced to learn Spanish, French or Arabic when they go on holiday? My Polish sister in law wouldn’t agree, she finds it outrageous that tourists centers abroad don’t speak English. I think – always use Polish, it is Poland and you can use English as well where necessary. It probably doesn’t really matter what language the signs are in the shop, because most people are capable of pointing at what they want. You don’t even need to speak to the person in the shop. This said, If you want to advertise services to tourists and you are involved in the service industry, it makes sense to advertise in many languages. Someone who would refuse to do this, because of some form of silly national pride would obviously lose business and wouldn’t last very long. If you want to be successful in business make your business as accessible to as many as possible. If you want to be a nationalist join a marching band. Use Polish. It is no fun to go to visit a place that one expects to be different from their ‘home’, and then find it is the same. Personal opinion- know enough English to speak some and be sociable to a visitor, while it (should be) enjoyable and advantageous to a visitor to expend some effort to learn Polish. I am American, and love the polish people; would be very sad to not see Polish used if I were ever able to visit! @Jack why is there always some sad case bashing articles in local newspapers? Do you have a little club where you dish out the jobs? Do you have too much free time? A local journalist’s job is basically to write about local issues or to put a local slant on a national/regional story. Mr Casey has satisfied both those requirements with this story. It is rather silly to go into another country and expect to see signs up in your language, because you do not speak or read the language of the country you are visiting. I do not speak much Polish or read it even though I am half polish, but that is my problem. To be honest I would be less likely to frequent a shop whose signs have an English translation or are totally in English because I view it as an insult to the local population. It should be expected of the visitor to either learn a smattering of the language or just to make themselves understood somehow. Tourist information points should be the places where you’d go for translations. If it is in Poland speak the local language if one is living there. It’s not easy for anyone. At least in the City Center English signs would be of a good help for those who come on holiday and will not stay in the City. For Expats like m still struggling with the language… Well people keep learning and show respect for the country at least. I am English, my wife’s Polish, I speak Polish, I do my best when in shops or restaurants, I think the Polish people appreciate foreigners trying to speak the language, its not so easy, the grammar is what’s I get stuck on. You can easily go to Crakow without Polish. They speak English over there!